Sometimes if you really want to get to the heart of a subject you have to strip a few layers of realism from it. Mutant Football League is a prime example. American Football is a brutal sport (so long as you don't compare it to rugby too often) but EA's Madden games can only go so far in exploring that. Make your players a horde of werewolves, demons and other assorted hellspawn, though, and suddenly teasing out the tougher elements of the sport becomes a bit less problematic. As well as adding in a host of extra features such as additional teams and other DLC, this Dynasty Edition comes with a pretty huge new way to play: Dynasty mode. 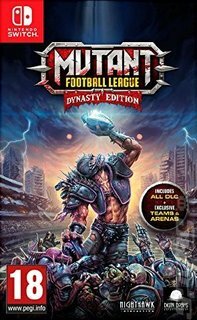 Every other self-respecting sports game has its management mode and now Mutant League Football does too. Take a scrappy team through multiple seasons to build a dynasty by utilising player trades, cumulative player XP, salary management, custom playbooks and free agent signings. It's all here, folks. Come join the Mutant Football League and do all the things Madden won't let you!